VISUAL QR CODES IN ACTION | Condor Solutions Ltd. Visual QR codes hit their Mark with the World’s Biggest Companies! The quick-response codes continue to evolve in ways never before seen. In my capacity as the co-founder and CMO of a QR Code company, I’ve watched with fascination as QR codes have come surging back to life. Part of the dilemma that developers in the QR codes industry faced, related to the intrinsically unappealing nature of these marvels. Many marketing departments using traditional QR codes used them incorrectly and failed to achieve their targeted goals. In hindsight, the error was not structural – as QR codes are sound – it was merely aesthetic. And given our culture of ‘that which looks good sells well’ it makes perfect sense. Coming to this realisation was easy; translating this objective into a workable solution was the real challenge. Thanks to some ingenious brainstorming by leading industry experts, visual QR codes are now firmly established. Better yet, they rank among the most promising marketing resources in a world that is turning to eCommerce like never before. Smartphones and the convenience they offer mean that consumers and passersby can now access marketing messages in real time – wherever they roam. Enter the era of the visual QR code; a marketing marvel that promises to turn convention on its head and recalibrate the way that we receive messages, rewards, information and multimedia. 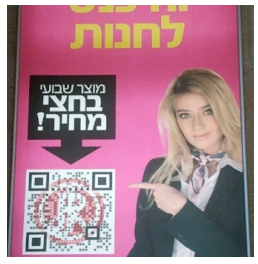 There are many successes with visual QR codes. One of my favourites is a campaign in the land down under. This success story takes us to Tyrol, Australia. A shopping mall – the DEZ Shopping Mall – was looking for creative ways to boost traffic. On average, the mall enjoyed the patronage of some 25,000 visitors. The challenge was to find novel ways of attracting the attention of shoppers and passersby so that they would interact more with the DEZ activities available on Facebook. The idea was to create a visual QR code in tandem with a mobile signup page. The goal was to get as many people to scan the QR codes as possible for the Easter Bunny promotion. The real test was how to engage users in such a way that would want to scan the QR codes. This was achieved by way of incentivising each scan with a points system. Folks were simply required to login and like the DEZ Mall’s fan page on Facebook to get started. 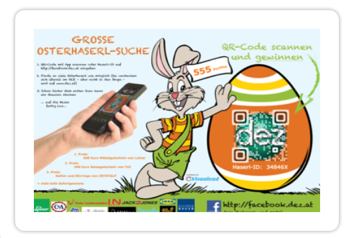 DEZ and my company created 177 Easter Bunny posters with virtually invisible QR codes. These posters were strategically placed around the mall. Over a 10-day period participants got points for every scan – sometimes with prizes up for grabs too. By the conclusion of the promotional period, the top 3 participants received the biggest prizes on offer. These are the results we collected from the promotion: 10,000 scans were generated, the visual QR codes with the Easter Egg and QR code juxtaposed were scanned 150% more than the regular black & white QR code. ← Are Mobile Payments Risky?